A black currant thread winds through this dense, muscular red, with cherry, leather, earth, iron and mineral flavors. Firm and fleshy, with fine balance and a long, expansive finish. Sangiovese, Cabernet Franc and Cabernet Sauvignon. Best from 2020 through 2033. 5,000 cases imported. Really pretty aromas of currants and roses follow through to a medium body, firm and silky tannins and a fresh finish. 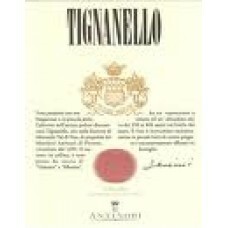 Very well done for 2014 and a wonderful Tignanello to drink now or later. Better in 2019.